Before I even knew of biketrial I once in a while rode and ride my Montesa Cota 311 — see one of my first posts. This Old Lady is from 1992 and has just seen a mere 1554 kilometres. But some things wear over time and not over kliks. So I brought both front legs to a nearby repearshop to have them well done. New fork seals and fresh oil. Because the old seals leaked the brake pads were oiled all over. Luckily a nearby mopped dealer had some of the same pads. Great that some things don’t change over time — exept that the brakes on my Montesa back then were something very innovative compared to the drum brakes used before, and are now standard equipment of 50cc supermotard moppeds. 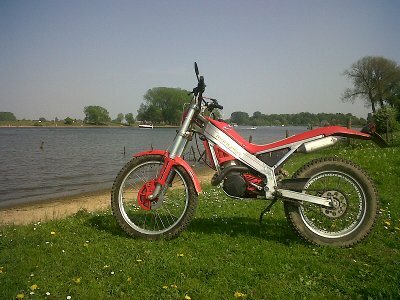 Anyway, my Montesa was ready for a sorty! Here just standing on the nearby banks of the river Meuse. This entry was posted on 8 May 2011 at 17:01 and is filed under Biketrial. You can follow any responses to this entry through the RSS 2.0 feed. You can leave a response, or trackback from your own site.